"I firmly reject the statements of those who speak of Crimea as a "done business." President Petro Poroshenko criticized the president of the Czech Republic Milos Zeman for his call to recognize the annexation of Crimea by Russia in exchange for compensations of Ukraine. "PACE was not created as a place to bargain territories for money, oil or gas. 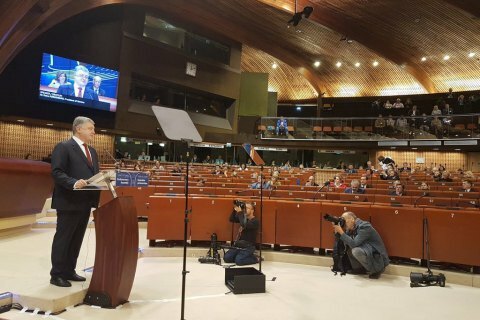 I strongly reject the statements of those who speak about Crimea as 'done business'," he said, speaking at a plenary session of PACE. Poroshenko said that Russia's goal is to destroy liberal freedoms and human rights. "In some places they do it with tanks, in other use false news," he said. "They seized hostages to blackmail Ukraine, who will never abandon its citizens neither in Crimea nor in Donbas nor in Russian prisons. I cannot but remember our political prisoners – Oleh Sentsov, Oleksandr Kolchenko, Roman Sushchenko, Ihor Kozlovskyy and many others," the president added. Poroshenko also asked the newly elected President of the PACE Stella Kyriakides not to violate the principles on which the organization is built upon.